Roast the hazelnuts for a few minutes in a pre-heated oven (180 °C) or in a frying pan. Remove the skins by rubbing them and then chop the nuts coarsely. Brown the finely chopped onions in olive oil in a Cocotte for 5 minutes on a low heat. Add the rice and stir for 2 minutes on a high heat to stop it going brown. Add the white wine and stir until the wine has boiled away. Add the salt and rosemary. Gradually add the hot broth stirring constantly. 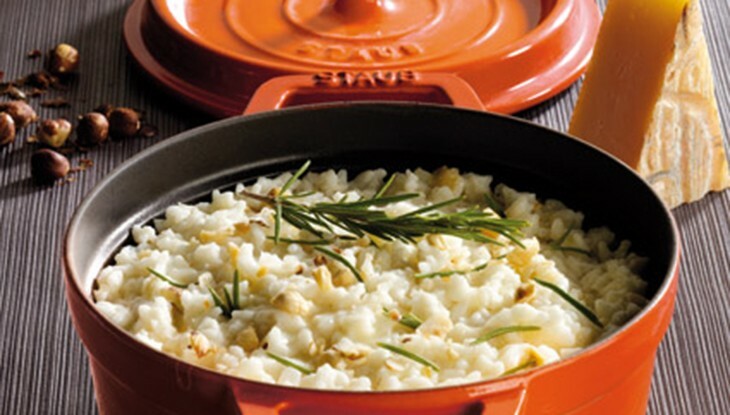 When the risotto is cooked (after about 16-18 minutes), remove the pan from the heat source and use a spoon to stir in the diced Taleggio (having removed the crust). Season. Add the butter, Parmesan and half the hazelnuts. Stir well, cover and let it stand for 2 minutes. Garnish the risotto with the roasted hazelnuts and serve.